Invest Money Better: SBI Life Smart ULIP Concepts - Exposed with fund performance? - IN THIS POLICY, THE INVESTMENT RISK IN INVESTMENT PORTFOLIO IS BORNE BY THE POLICYHOLDER - Forget about Guarantee. - Assure Guarantee of highest NAV in during the first seven years on Maturity. - Manage and give you maximum opportunity for your investment to grow while protecting your investments against market conditions. SBI Life smart ulip offer two funds Flexi protect fund Series II and Money market fund. Flexi protect fund Series II and Money market fund has no minimum contribution for equity (Stock Market) in fund allocation But, Still both funds can invest in equity. But they will never invest in stock market. The premium amount after deducting for all the high ULIP charges will be invested in Money market fund first then these units will be diverted into Flexi protect fund Series II based on pre decided date. So, Your NAV will be always near to your initial NAV of Rs 10 because there is no equity exposure which gives excellent return in 7 years or long run. 2) Flexi Protect Fund Series II from 8th JAN'09 to 20th MAR'10, The NAV rise from 10 to 10.8871 respectively. You will be knowing Equity(Nifty and Sensex) both have given more than 65% return from 1st Jan’09 to 1st Jan’10.Your funds NAV are still constant at around Rs 12 and Rs 10.
additionally, You are not getting enough insurance coverage here too. Just calculate 5 times of your annual premium will be your insurance coverage.If you consider annual premium of Rs 40,000 then also you will get Sum assured of Rs 2 lakh only. Summary: SBI life smart ULIP plan does not give enough insurance coverage and enough return because it has no flavour of Equity. Rather,You will bet higher sum assured using Term Insurance and high return using SIP in any diversified mutual funds over next 7 years. 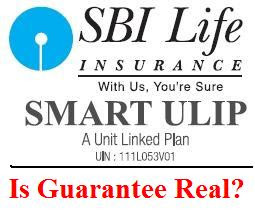 SBI life smart ulip simply fails on all aspects as other highest guarantee funds fails.